The Mosquito Crusades: A History of the American Anti-Mosquito Movement from the Reed Commission to the First Earth Day. By Gordon Patterson. New Brunswick, NJ: Rutgers University Press, 2009. Today Florida is viewed as a semi-tropical paradise, one in which Crockett and Tubbs patrol the brimming nightlife in Miami, from which orange juice is shipped all over the world, and to which everyone goes to theme parks such as Walt Disney World or Universal Studios or you name it in Orlando. But it was not always so, and my longtime friend and colleague, Gordon Patterson, tells in this fine historical work part of the reason why. Mosquitos, disease spread by them, and swamps go together and in the tropics they combine to create a potentially deadly situation. Suppressing mosquitoes was long an objective for those in Florida, in the process helping to eradicate malaria, yellow fever, encephalitis, and dengue fever. 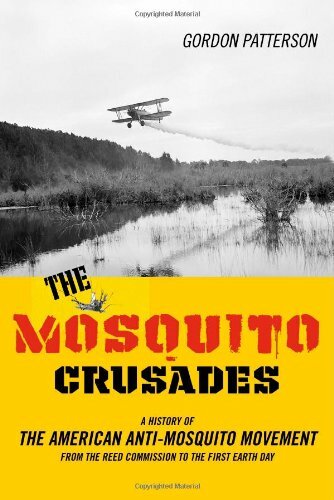 The Mosquito Crusades tells this story with appropriate attention to balanced, scholarly analysis, style, and a flare for the drama of this core story. Gordon Patterson, professor of history at the Florida Institute of Technology, has long been interested in efforts improve through science and technology the habitability of Florida and this study helps to illuminate a little-known effort to undertake mosquito control. It begins with the Reed Commission in 1900, an organization that sponsored experimentation in developing countermeasures for yellow fever. It ends with the first Earth Day in 1970. In between, Patterson’s account ranges from the history of medical entomology to campaigns of pesticide distribution to political efforts to limit the use of pesticides to the give and take of efforts in Florida for advancing pest control and the safety of the public. This is a very fine book about the history of a virtually unknown story in twentieth century America. It does much to rescue from obscurity an important account to control mosquito populations and the diseases they spread. This entry was posted in History and tagged Florida Institute of Technology, Gordon Patterson, Rutgers University Press, The Mosquito Crusades: A History of the American Anti-Mosquito Movement from the Reed Commission to the First Earth Day, Universal Studios, Walt Disney World. Bookmark the permalink.